Beyond the headline numbers, the underlying data also reflect record-breaking strength in many areas. This includes sales, which are expected to grow 5.7 percent over the next 12 months, the fastest pace since the fourth quarter of 1997. In addition, the rates of growth for capital spending (3.9 percent), employment (2.9 percent) and inventories (1.7 percent) over the year are at new all-time highs in the first quarter survey. With ever-tighter labor markets, wages for full-time employees are predicted to rise 2.6 percent over the next 12 months, the highest rate in 17 years. For the second straight survey, the inability to attract and retain a quality workforce registered as the top business challenge for manufacturers, cited by 74.7 percent of respondents. Those manufacturers completing the survey predict 3.0 percent growth in product prices over the next 12 months, jumping from a 1.9 percent gain in December. This was the fastest growth rate for prices since the second quarter of 2011, or in nearly seven years. The recent acceleration in prices is consistent with other data, including the latest consumer and producer price reports, even as overall cost pressures remain modest for now. Moreover, 64.6 percent of manufacturers cited rising raw material costs as a primary challenge in the NAM’s survey, making it third on the list after workforce issues and health care costs. On the latter, respondents anticipate 7.7 percent growth in health insurance premiums over the next 12 months. Meanwhile, the National Federation of Independent Business (NFIB) reported that the Small Business Optimism Index pulled back in March from February’s level, which was the second-highest reading since July 1983. The headline index declined from 107.6 in February to 104.7 in March. Even with some easing in the latest survey, the robust data seen for much of the past year would suggest a healthy outlook overall in the economy. Along those lines, the labor market remained strong. The percentage of respondents with positions they are unable to fill right now edged up from 34 percent to 35 percent. In addition, respondents cited the quality of labor as the top “single most important problem” (21 percent), illustrating the tightness of the job market for small businesses. Taxes fell to the lowest level since 1982 (13 percent), according to the NFIB, in the aftermath of tax reform, with regulatory burdens being second on the list in March (14 percent). Regarding the labor market, hiring in the manufacturing sector rose in February to its best reading since November 2007. The manufacturing sector hired 380,000 workers in February, reflecting stronger activity for both durable and nondurable goods businesses. At the same time, total separations—including layoffs, quits and retirements—rose to 352,000. As a result, net hiring (or hires minus separations) increased to 28,000 in February. More importantly, net hiring has averaged a rather healthy 16,417 over the past 12 months, with a robust average of 25,142 over the past seven months. At the same time, there were 426,000 manufacturing job openings in February, the strongest reading since September (445,000), which was a pace not seen since January 2001. This week there will be new data on industrial production, which it is hoped will show that strong gains made over the past year are continuing. In February, manufacturing production jumped 1.2 percent, with 2.5 percent growth over the past 12 months, the best year-over-year rate since July 2014. Similarly, manufacturing capacity soared to 76.9 in February, a reading not seen since April 2008. There will also be updated assessments of activity in the New York and Philadelphia Federal Reserve Banks’ districts, which are anticipated to reflect continued progress and an upbeat outlook for the next six months. Other highlights this week include the latest figures for GDP by industry, housing starts and permits, leading indicators, retail sales and state employment. The Bureau of Labor Statistics reported that consumer prices inched down 0.1 percent in March, falling for the first time since May 2017. The decrease in costs stemmed largely from reduced energy prices, which fell 2.8 percent in March, with gasoline prices off 4.9 percent. This is mostly consistent with data from the Energy Information Administration, which pegged the average price for regular conventional gasoline at $2.544 per gallon on February 5 but fell to $2.455 a gallon on March 12. Note that gasoline costs have risen since then, up to $2.587 per gallon on April 9, which should boost consumer prices in the April data. At the same time, food prices edged up 0.1 percent in March, bouncing back slightly after being flat in February. Since March 2017, food and energy costs have increased 1.3 percent and 7.0 percent, respectively. Excluding food and energy, core consumer inflation rose 0.2 percent in March, matching the pace in February. Higher costs for medical care, shelter and transportation services helped to push core consumer prices higher in the latest data, with lower costs for apparel, household furnishings and new and used vehicles. The bottom line was that the consumer price index has risen 2.4 percent over the past 12 months, the fastest year-over-year rate since March 2017. Despite the acceleration in consumer costs on a year-over-year basis, overall pricing pressures remain mostly modest. While the current year-over-year pace represents an increase from 1.6 percent in June 2017, it remains well below the 2.8 percent pace in February 2017. Moreover, core consumer prices, which exclude food and energy costs, have risen 2.1 percent over the past 12 months. This would indicate that inflation remains under control for now, even if it has picked up in recent months and is just slightly above the Federal Reserve’s 2 percent target. In the latest Manufacturers’ Outlook Survey, 93.5 percent of respondents feel positive about their own company’s outlook, the second-highest reading in the survey’s 20-year history following the all-time high of 94.6 percent in December. Optimism has been at historically high levels over the past five quarters, averaging 92.1 percent. Sentiment is sharply higher than two years ago, with an average of 64.3 percent in 2016. 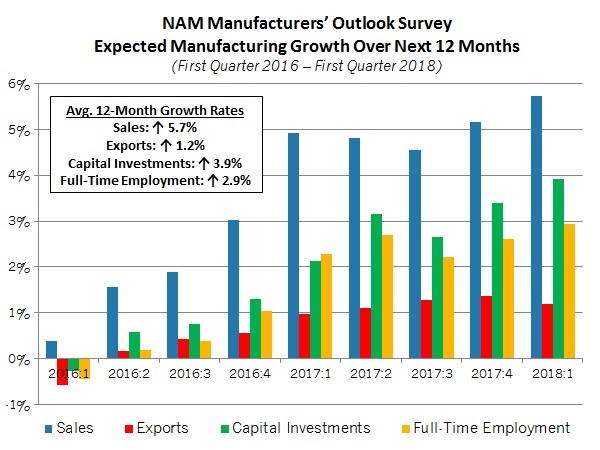 Manufacturers continue to be upbeat following Washington’s passage of the comprehensive tax cuts package and its less burdensome approach toward regulatory policy—pro-growth stances that will help manufacturers compete in the global marketplace. Those manufacturers completing the survey predict 3.0 percent growth in product prices over the next 12 months, jumping from a 1.9 percent gain in December. This was the fastest growth rate for prices since the second quarter of 2011, or in nearly seven years. The recent acceleration in prices is consistent with other data, and in the survey, 64.6 percent of manufacturers cited rising raw material costs as a primary challenge, making it third on the list after workforce issues and health care costs. On the latter, respondents anticipate 7.7 percent growth in health insurance premiums over the next 12 months. The National Federation of Independent Business (NFIB) reported that the Small Business Optimism Index pulled back in March from February’s level, which was the second-highest reading since July 1983. The headline index declined from 107.6 in February to 104.7 in March. Note that readings above 100 are consistent with strong growth among small business owners, and even with some easing in the latest survey, the robust data seen for much of the past year would suggest a healthy outlook overall in the economy. Along those lines, the labor market remained strong. The percentage of respondents with positions they are unable to fill right now edged up from 34 percent to 35 percent. In addition, respondents cited the quality of labor as the top “single most important problem” (21 percent), illustrating the tightness of the job market for small businesses. Taxes fell to the lowest level since 1982 (13 percent), according to the NFIB, in the aftermath of tax reform, with regulatory burdens being second on the list in March (14 percent). Despite those positive readings, most of the underlying data decelerated in March, mirroring the headline number. The percentage of respondents saying the next three months would be a “good time to expand” fell from 32 percent—an all-time high—to 28 percent, and the percentage of those expecting sales to rise over the next three months declined from 28 percent to 20 percent. Similarly, capital expenditures activity remained promising despite some easing, with the percent investing in capital declining from 66 percent (its highest point since 2004) to 58 percent. Those planning to make a capital expenditure over the next three to six months fell from 29 percent to 26 percent. The Bureau of Labor Statistics reported that producer prices for final demand goods and services rose 0.3 percent in March. For manufacturers, producer prices for final demand goods also increased 0.3 percent, bouncing back after edging down 0.1 percent in February. Food costs notably rose in March, up 2.2 percent, largely on sharp increases for eggs, finfish and shellfish and fresh and dry vegetables. At the same time, energy prices fell for the second straight month, down 2.1 percent in March. On a year-over-year basis, final demand food and energy costs have risen 2.1 percent and 8.5 percent, respectively. Excluding food and energy, producer prices for final demand goods rose 0.3 percent in this report, increasing for the eighth consecutive month. Overall, producer prices for final demand goods and services have increased 3.0 percent since March 2017, the fastest year-over-year pace since November. In general, raw material costs have accelerated over the past year, with the year-over-year pace being 2.2 percent in March 2017. Recent sentiment surveys have tended to echo this finding, with input prices at multiyear highs in many such reports. Similarly, core producer prices—which exclude food, energy and trade services—have also increased 3.0 percent over the past 12 months, up from 2.7 percent in February. For comparison purposes, core producer prices registered 1.8 percent year-over-year at this point last year. The University of Michigan and Thomson Reuters reported that consumer confidence pulled back in April from March’s 14-year high, largely on recent volatility in equity markets and the impact that has on personal finances. According to preliminary data, the Index of Consumer Sentiment dropped from 101.4 in March—the highest level since January 2004—to 97.8 in April. The press release cites policy uncertainties as a concern for many respondents, especially regarding trade policy. Despite the easing in April’s headline index, Americans continue to be more optimistic over the long term. In April, consumer sentiment softened in perceptions of both current (down from 121.2 to 115.0) and future (down from 88.8 to 86.8) economic conditions. The current economic conditions index registered an all-time high in March, with April’s reading representing a deceleration from that point. Even with the weaker April data, these figures are consistent with 2.7 percent growth in consumer spending over the next 12 months. Final data will be released on April 27.